Almost one year ago in July 26th few friends decide to start a group home baker’s group. We baked our first cake and revealed on 15th August. Every month we get expose to new recipes or new techniques. It really fun, we were able to bake difficult macrons, pillowy cotton cheese cake, melt in mouth chocolate cream cheesecookies, spongy bread with tangzhong method etc are few. I was able to make few great friends. I was also happy that we are small group but always try to bake challenge recipes on time. Number doesn’t matter what matters is the quality that we have. It is also coincidence that this month we baked cake. This month challenge recipe was suggested by Humi of Gheza-e-shiriin suggested Medovik/Medovink/ Russian Honey cake/Honey bread and Saraswathi of Sara’s kitchenshared this Lemon Glow Chiffon cake. I was familiar with chiffon cake, as it is easily available in bakeries. 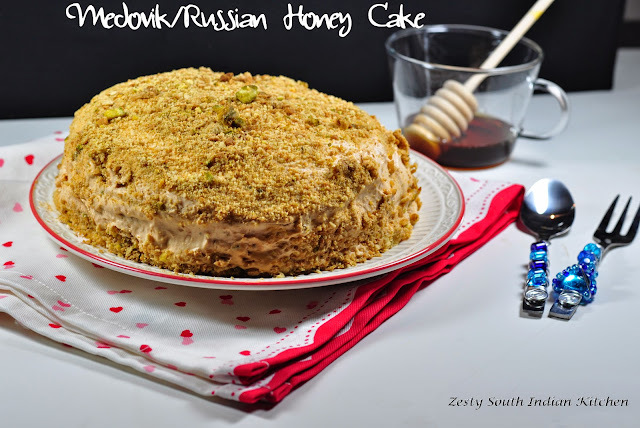 So decide to try that later, for this month challenge I want to try Medovik/Russian honey cake as I never heard of them. 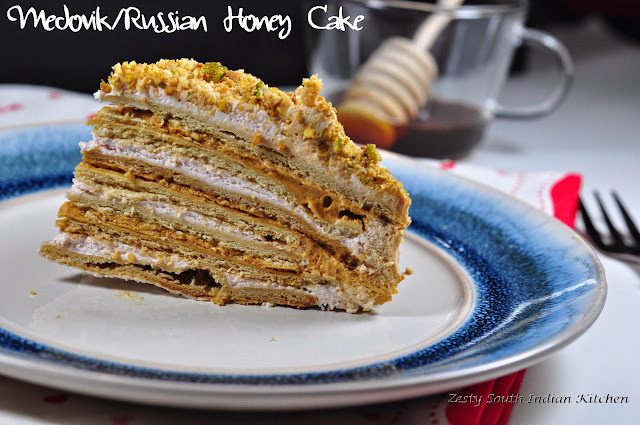 After reading I came to know that it is one of the most popular cakes in Russia. It is also popular in central, north and Eastern Europe. It has 6 cookie type layers which are combined with a sour cream type of cream or Dulce de leche. Rest of countries love to decorate their cake with nuts and scraps of baked cookies, where as in Slovakia and Czech people like to decorate their cake with a beautiful folk art. Take a look at here to read more about its history. It is more a cookie than cake stuffed with filling. Finished product will looks more like a crepe cake covered with filling. 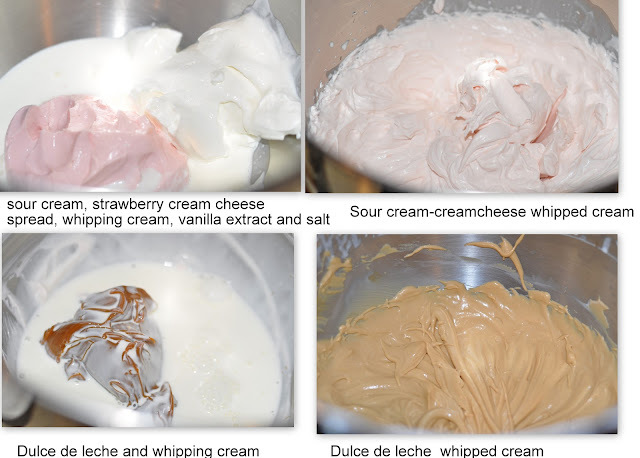 Since challenge recipe has two versions on with sour cream and other with Dulce de leche. I bought both. 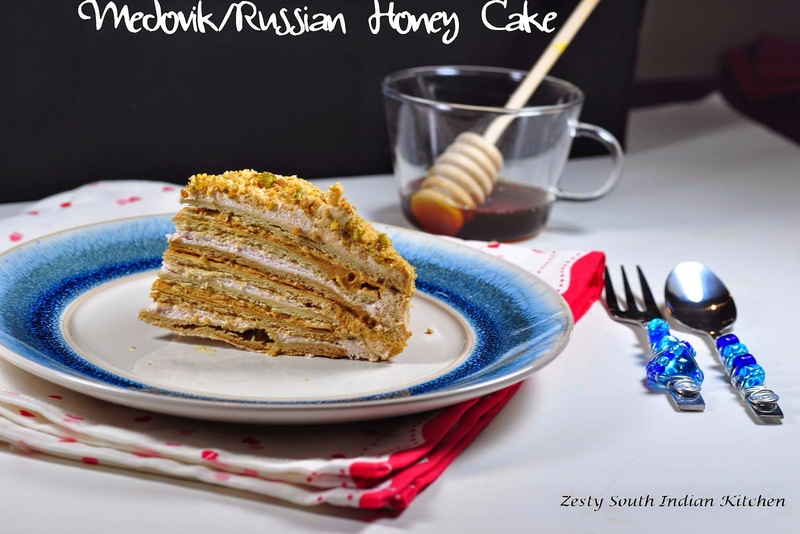 Then carefully look at the recipe, I came to know that there is both honey and sugar in cookie and also in frosting. So I decide to reduce 1 cup of sugar to 1 tablespoon in the cookie and in the filling I didn’t add any extra sugar. I use two kind of filling, one is with sour cream, and strawberry cream cheese spread and whipped cream. Second one is dulce de leche and whipped cream. I found that these filling slightly runny and in order to make it medium consistency you need to use cream cheese instead of cream cheese spread or powder sugar. On the day of baking you can’t enjoy this delicious treat, you need to weight overnight to get the filling gets soaked into the cookies and mingle with it. I baked a 6 layer cookie and then filled with sourcream cream cheese filling and ducle de leche whipped cream then topped with pistachios and powdered leftovers of cookie. It is delicious my prince enjoyed as such, while my daughter is fond of only filling. Hubby did a small taste test. I enjoyed the whole. 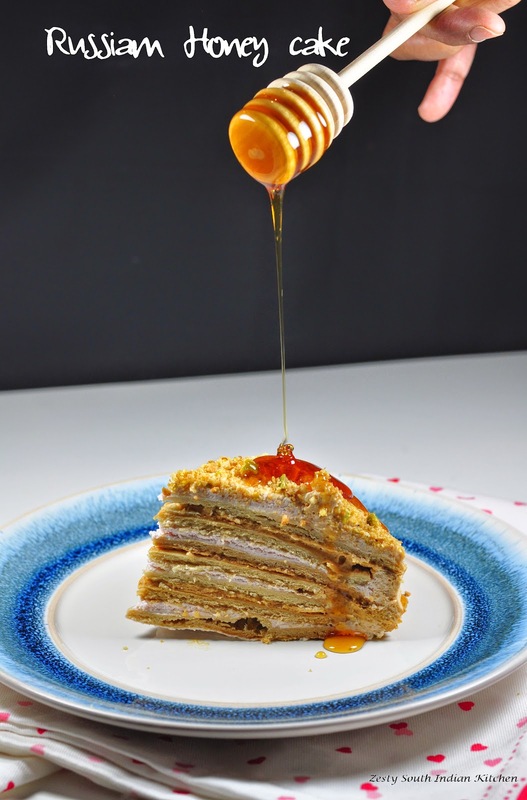 If you like sandwich cookies, then try this, it has unique flavor of honey and sugar well balanced with caramel ducle de leche and tangy sour cream –cream cheese spread. Yummy that is the only word I can say. My version is not overly sweet, if you want more sweet dessert then increase sugar in cookie and also filling. If you want to know what other baking partners are baked, please visit each one of them as they tell each individual stories. If you want to bake with us from next month, and be part of baking partners then shoot me e-mail. In a heat proof mixing bowl add egg and sugar and lightly mix. In a microwave safe bowl add honey and butter and microwave at 30 seconds for high. In a double boiler, cook the egg and sugar mixture, stirring constantly with a spoon or a balloon whisk, until the ingredients are well blended and the mixture is smooth, about 3 minutes. Add the baking soda, and cook, stirring constantly, for another half a minute. The mixture will somewhat whiten and increase in bulk. Remove the bowl from the heat. 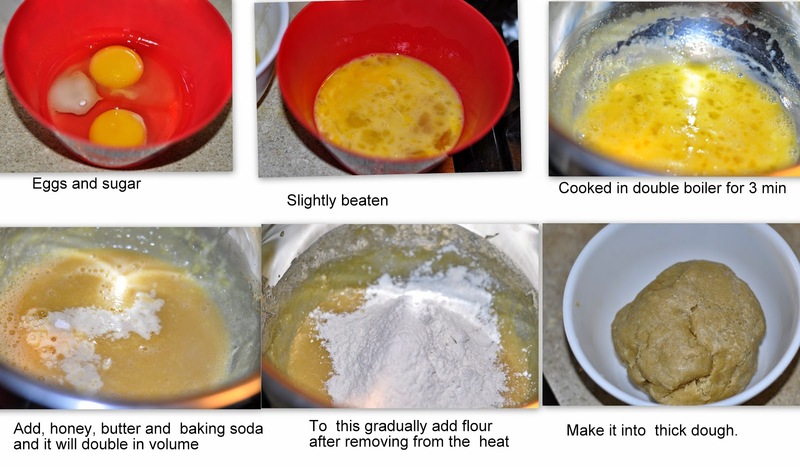 Gradually add 2 cups of the flour to the mixture, mixing with a spoon with each addition, until you obtain dough that is somewhat sticky and has consistency of play dough. If the dough thickens add little hot water to make pliable dough. Do not be tempted to add more flour as the dough will harden as it cools off. 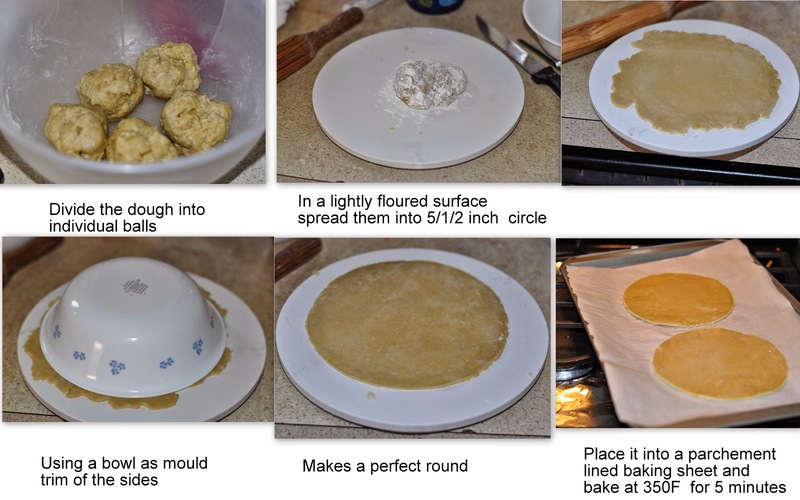 Divide the dough into 6 parts and about 79g, shape each part into a ball. Preheat the oven to 350F (180C). Line a baking sheet with a parchment paper. Now, take one dough ball and put it in the middle of your tortilla maker of cutting board. With your fingers or roller, press onto the dough and flatten it into a thin 5 ½ inch circle using a bowl as a mould. Trim of the sides to make a perfect circle. If the dough sticks to your hands, dip your fingers in flour before pressing onto the dough. The flattened dough may appear somewhat transparent in some places – it is OK. But take care not to tear it and patch with a piece of dough if you do. Bake each cookie on the middle rack of the oven for 5 minutes, until it is light golden on top. The dough will slightly puff up, but don’t expect it to rise as a sponge cake. Do not over bake. Remove from the oven, gently run a spatula underneath the cookie to loosen it, and then remove from the baking sheet. Repeat the process for all 6 layers. You will be able to bake all the cookies in two turns. Reserve the scraps as you need crumb to top and sides of the cake. It will take 10 minutes to bake the scraps. Spread a generous amount of sour cream-cream cheese whipped cream onto one cookie, then top with another. Then fill with dulce de leche whipped cream. Then top with another cookie Continue in this manner – stacking the layers on top of one another and spreading some cream in-between. 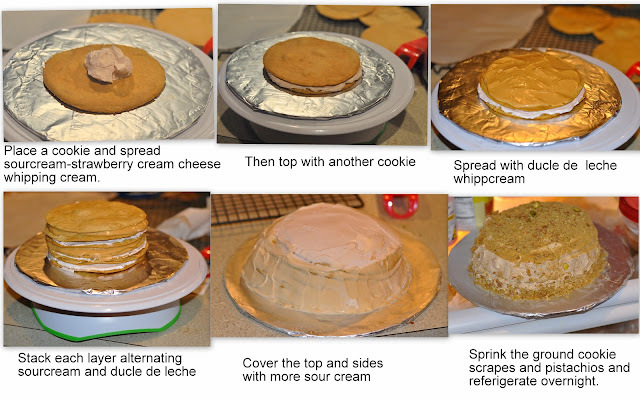 Cover the sides and top of the cake with cream as well. Finely grind the baked trim-offs with pistachios. Sprinkle the crumbs generously on top of the cake and lightly press some around it. At this point, the cake will be hard. Leave the cake aside to soften, refrigerate overnight. The cookies will have absorbed the cream and the cake will be soft and ready. Wow, your cake looks so awesome. I love the strawberry variation on it! I had a hard time deciding on the filling as well, I just bailed and went classic sour cream. Swathi it looks great,the pics are so pretty and inviting.. adding the strawberry flavor sounds great..it was great challenge,my family enjoyed the cake. Happy Anniversary to the group,keep rocking! Dear Swathi, I wish, I could have baked this cake. It looks fantastic. I love your photos because they explain very clearly all the process and the result. WOW. You guys really choose challenging recipes! Honey cake looks yummy.. Love your clicks..
Wow stunning cake Swathi loving it. That drop of honey make me drool hmmm sooo yum. Beautiful layers, I skipped this thinking it would be a lot of work but am thinking of making it some time soon. Nice pics. Ramya you need to add little water if the dough become thick. I did that. Cake looks great Swathi. Love the strawberry fillings. So you used two fillings? That’s awesome, Swathi! Lovely cake Swathi, Happy Birthday Wishes to Baking Partners. Cannot beleive its been one year since you have started the group. All the best wishes to you and group!!! delicious tempting droolworthy and inviting cake with an awesome presentation. Looks wonderful swathi, luv the texture. I really enjoy seeing the entire process of you making this honey cake. The finish touch with the drizzle of honey is simply brilliant! Nice to have you interested in hosting CLAS in June 2014. Is there any email account that I send you the details? 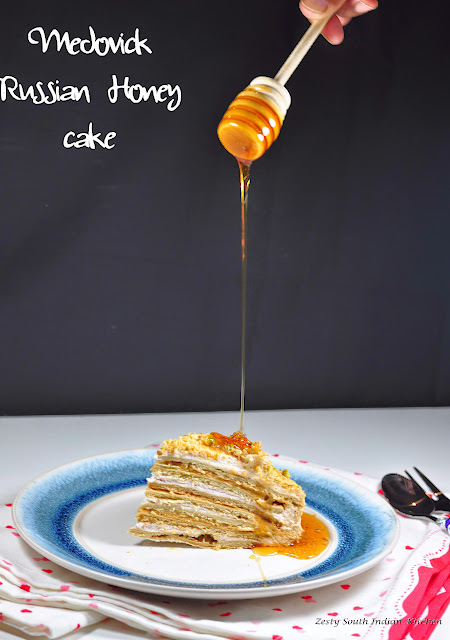 Your honey cake looks scrumptious Swathi! I want to make this one too! Happy Anniversary to Baking Partners! Thank-you for starting the group and all the work and time you put into it! Wonderful, scrumptious and very interesting cake dear..!! Congrats on the milestone… Loved the first click!! just drooling over the layers..and great tutorial post dear !! WOW! What a cake! Great job on meeting the challenge. this is awesome! The cake looks super yum and love the layer, great shots too! It looks like a lot of hard work to make this cake, I dunno how you nail it time and again! !